Portland Community College’s 56th commencement ceremony will feature a nationally respected political figure and a student from Columbia County who wants everyone to embrace their warrior side. U.S. Sen. Jeff Merkley keynotes the college’s signature, culminating event, which begins at 7 p.m., Friday, June 15 in the Memorial Coliseum, 300 N. Winning Way. He will inspire 900 graduates, who will walk across the stage to receive their associate degree or certificate. In total, nearly 5,800 total degrees and certificates will be awarded this year. 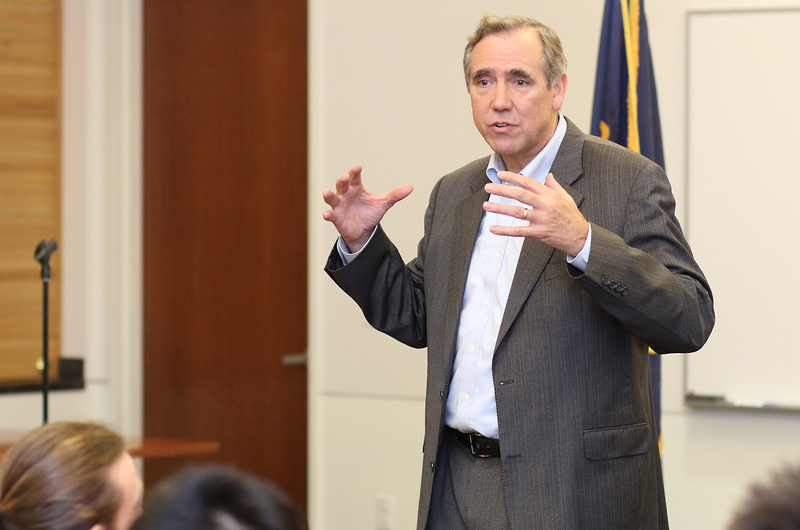 Sen. Merkley is the son of a millwright and the first in his family to attend college. Born in the timber town of Myrtle Creek, Oregon, he earned an undergraduate degree from Stanford and a graduate degree in Public Policy from Princeton’s Woodrow Wilson School of Public and International Affairs. Following his education, he worked as a national security analyst at the Pentagon and at the Congressional Budget Office. In 1991, he returned to Oregon to lead Portland’s Habitat for Humanity, a nonprofit that empowers low-income families through homeownership. Sen. Merkley went on to serve as president of the World Affairs Council in Portland before entering the Oregon House of Representatives in 1998. He became Speaker of the House in 2007 where he led the legislature to increase education funding, expand access to affordable prescription drugs, pass landmark environmental and energy legislation, establish domestic partnerships, crack down on predatory payday and title lending, and create Oregon’s first ever “Rainy Day” fund. Elected to the U.S. Senate in 2014, he continues to fight for living-wage jobs and to push back on unfair trade policies that ship Oregon’s jobs overseas. He has worked to make college more affordable for students and retirement more secure for seniors. Sen. Merkley serves on the Senate Committees on Appropriations; Environment and Public Works; Budget; and Foreign Relations. Pushing the inspiration even more is student speaker Awen Moon Gatten. The 49-year-old mother from Columbia City (Columbia County) is an accomplished student leader at the Rock Creek Campus. Gatten, who sports a 4.0 grade-point average, served as the Rock Creek chapter president for Phi Theta Kappa (two-year honors society), earned the 2018 All-Academic Team scholarship from the state of Oregon, is a PCC Foundation scholarship recipient, and was recently elected to serve as PTK’s Northern District Executive for the Rocky Mountain Cascade region. Gatten’s dream is to work as a high school math teacher once she completes her degrees at Portland State University in the mathematics and education programs. Her enrollment at PCC in winter of 2016 to begin her associate degree was a pivotal moment for Gatten. A 35-year-survivor of child abuse, domestic violence and sexual assault, Gatten’s academic success at the community college enabled her to close that chapter of her life. Five years before entering PCC, she was able to leave her abusive husband and situation at home. Eventually, Gatten had the confidence to head toward a new career in mathematics. “I wanted more for myself,” reflected Gatten, who works at St. Helens High School as an Avid Tutor and volunteers as an Aspire Mentor. When she started college, she knew it wouldn’t be easy. Gatten graduated from high school in 1987, and it had been quite awhile since she was a student. She worried about returning to school after a 28-year hiatus and whether she’d be successful academically. 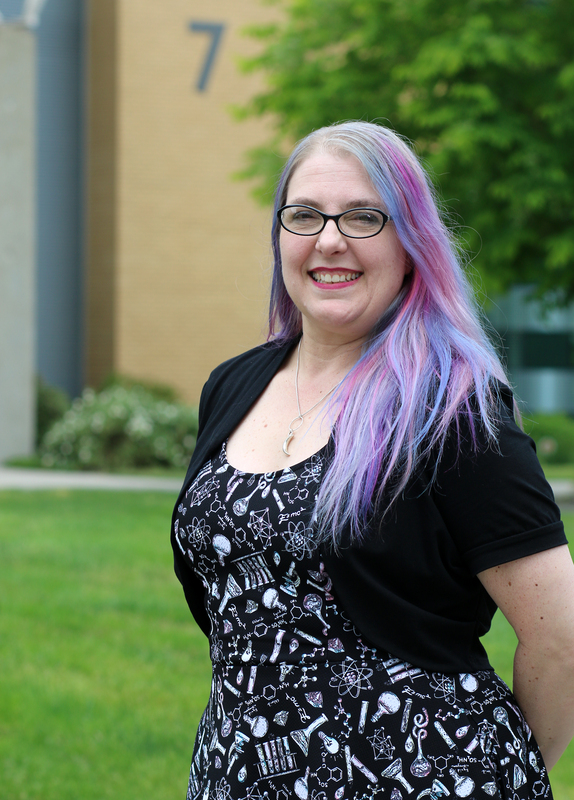 After her first term, Gatten quickly gravitated to her renewed love of math, and her success in those courses, as well as writing, gave her the confidence to move forward with her associate degree. Her commencement speech will center on her published poem in PCC’s “Bellwether Review” titled “I Am a Warrior.” It tells the story of how she became a warrior, using the darkness of her past abusive situations to lift herself up through education. The final step in her transformation was legally changing her first and middle names last summer. PCC’s graduation is open to the public and no seating tickets are required. Parking will be free at the college’s Cascade Campus (705 N. Killingsworth St.) day of the event, with free shuttles running to and from the Memorial Coliseum. Shuttles will leave from Cascade beginning at 4 p.m. and will run approximately every 15-20 minutes and will continue until one hour after the ceremony. Due to increased security, the Memorial Coliseum is implementing a new strict bag policy to help insure the safety of attendees. The new policy only allows bags that are no larger than one foot wide and one foot long and six inches deep, or smaller inside the venue. Anything larger will not be allowed. Way to go Awen!!! You rock girl! You are a true inspiration! Also, go PTK members! Unfortunately Mr. Merkley chose to turn an inspirational opportunity into a political speech. Many seated around me were not impressed and expressed their disappointment. Many colleges seek out past students that have become successful to inspire the graduates. Why not PCC? PCC Board of Directors, you can do better! I thought Merkely’s speech was fine. Yes maybe political but it also was inspiring because he believes in America. He believes in the ability to achieve and that success is determined by your choices. I was not impressed with PCC’s decision to have Merkely as a speaker! But PCC Just had to make it a night of political BS.